Makalu Trekking is one of the popular trekking destinations in Nepal. Mt. Makalu (8463m./27765ft.) is the fifth highest peak in the world. There are various other mountains Mt. Chamlang (7319 m./24012ft. ), Mt. Baruntse (7129m./23389ft.) to name a few stretched over 40 km along with Mt. Makalu, which lies at the eastern part of the country and Makalu area is protected by the Makalu Barun National Park and Conservation Project. The park was established in 1992, which covers altogether 2330 sq km. Makalu trekking does not only offer a remarkable sceneries of the mountains but also the varieties of flora and fauna, the plants of all major ecological zones, tropical, sub-tropical, temperate, alpine and sub-alpine that are found in the national park, is considered the home to a rich variety of wildlife. This trekking is considered to be a natural paradise, as because the tour includes the beautiful mountains, pristine forest, and a wide variety of plants, animal life and the simple and warm hearted people local people with rich and varied customs. 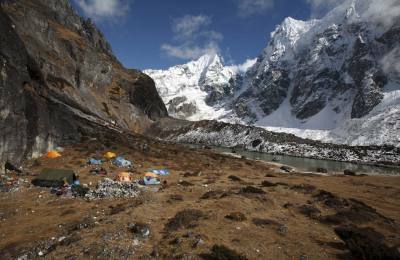 This is believed to be the low altitude trekking, mostly centered at Arun valley, the eastern part of Nepal. The valley that holds a mighty Arun River and dense forest that is contrasted with the terraced slopes, where you also can see that diverse tribal groups residing in unity and the Makalu-Barun National Park, an important conservation area of many species, which are on the verge of extinct. Makalu trekking is a well-loved trekking route among the clients of Himalayan Joy Adventure Pvt. Ltd.